It would certainly be no overstatement to claim that the entire world is under the spell of eCommerce. Right from high end electronics, luxury goods, household items, furniture to the more everyday essentials such as grocery we have it all here. If anything, this is an enormous opportunity for those in the eCommerce business. While clearly it is eCommerce giants like Amazon who continue to rule the roost, there are various ways in which you can amp up the success factor for your eCommerce business, fledgling or otherwise. If you are keen to unearth these elements, then read further and get enlightened with these eight tips. Build a great website – Nothing speaks more highly of your eCommerce business or brand, than your website. Website design must be given a lot of importance, especially as technology continues to transform our world. Design a website that is responsive, as this guarantees that your site renders correctly across all platforms and devices. It is all about creating a rich and satisfying user – experience, so optimizing your website for whichever device they use is critical to your success. Apart from being responsive, it is essential that your website displays a clean look and easy navigation. Product categories and sub categories should have their own landing pages, so that users can easily find what they are looking for. Find the right product – A lot of time, eCommerce business owners get beaten up over marketing, sales and other woes, but fail to realize that it’s the product they need to work on. Always start off with the right product, because to make huge sales, you need a product that people love and need at the same time. Your product selection has a huge impact on your conversion as well as repurchase rates. Not just selecting but also promoting your product is an essential tip to improve your eCommerce business. Know the pulse of your customers – Another essential for the eCommerce business is understanding your customers and following up with them. Tracking customer behaviour, purchase patterns and others purchase related insights are key to a successful eCommerce campaign. Your marketing strategy and tactics come to play in a big way here, existing as well as new customers should be marketed in the same way, and your tactics should reveal your understanding of your audience segments and how well you value them as customers. Customer is the king – A mantra that is often cited, but rarely executed. As eCommerce business owners it is important that you go above and beyond the expectations of its visitors. Customer service is the key here. What would ensure the return value of customers and build your brand trust is factors like ease of returning a product, free shipping, smooth delivery, promptly answering emails and queries. This is one core value that you need to build on for a successfully improving your eCommerce business. Ease of payment processing – Most purchases fail to convert to sales at the time of checkout, primarily because of inefficient or insecure checkout processes. Smart eCommerce businesses use payment gateway provider as these can considerably lessen the frequency and severity of online frauds. Using payment gateways ensure that customer personal date remains encrypted and secure as well as allows merchants to process credit, debit, and other alternative online payments. Stay on top with SEO – Ensuring that you are able to pull the right amount of traffic is important for any eCommerce business and this is where Search Engine Optimization plays a significant role. Your business needs to rank high among those organic search results for the maximum number of people to locate you. A good SEO strategy will pull your product in the top of the search pages. Strengthen your social media campaign – Social media and eCommerce are getting increasingly intertwined. With technology rising to newer heights, eCommerce brands can now customize and personalize content and leverage the power of social media site such as Facebook, Twitter and Pinterest. This is a great way to connect with existing as well as potential customers and maximize their reach. Get armed with a software – While a great team and an amazing product will help you get by, what really will catapult you in the big league, is an eCommerce software. 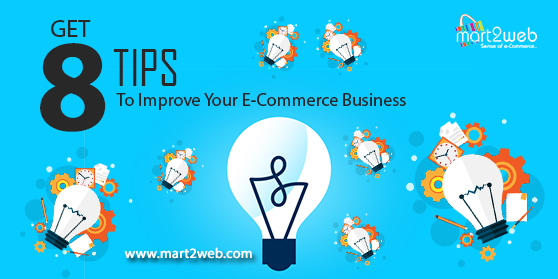 You need the potential of a software such as Mart2Web, which is conceptualized and designed by Sankalp Solutions, an eCommerce software company in India. What makes Mart2Web unique is that it is a powerhouse of features such as design, product management, payment, customer service and many others that distinguishes it as a best eCommerce software.